Thanks to Gabriel Lerner, MS4 at Boston University School of Medicine, Boston, MA (USA) and Drs. Lija Joseph, Bethany Tierno, Rebecca Shore and Murat Anamur of Lowell General Hospital, Lowell, MA (USA) for contributing this case and Dr. Genevieve M. Crane, Ph.D., Weill Cornell Medicine, New York, NY (USA) for writing the discussion. To contribute a Case of the Week, first make sure that we are currently accepting cases, then follow the guidelines on our main Case of the Week page. (1) So far in 2019, we have already posted 57 new job openings! Find the exact position that you have been looking for on our Jobs page by searching under the location or subspecialty subsections. (2) This year, our goal is to increase our active authors from 85 to 200 and our Editorial Board from 15 to 40. The Editorial Board is chosen from active authors who do a great job. If interested, please review our Author page at http://www.pathologyoutlines.com/authors and email your CV to NatPernick@gmail.com. (3) Congratulations to Dr. Thuy Linh Penedo from Baptist Hospital, Jacksonville, FL, for winning our Promotional email contest in December. We sent her a $50 Amazon gift card. To subscribe to our Promotional email, please click here and scroll down. 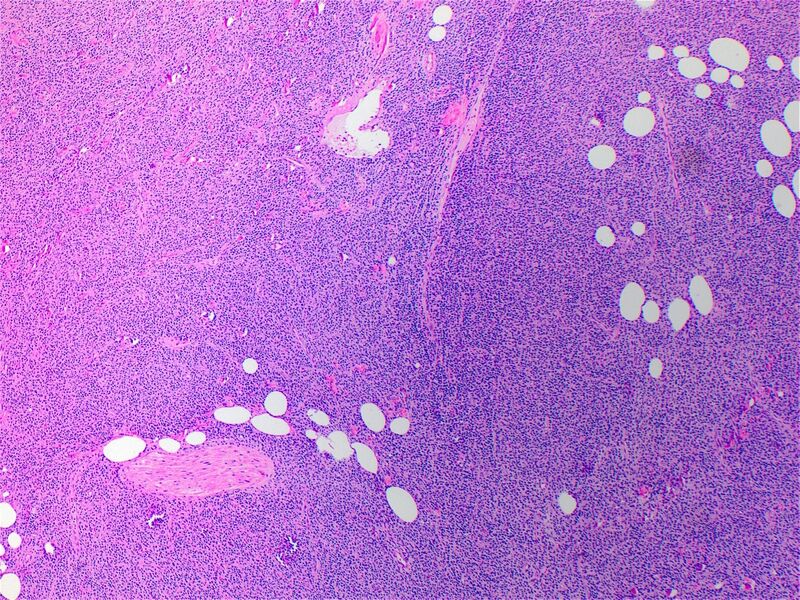 A 71 year old man presented with a 2 x 2 cm chest wall mass, which was completely excised. Which of the following immunophenotypic markers is typically negative in BPDCN? Blastic plasmacytoid dendritic cell neoplasm (BPDCN) is a rare, clinically aggressive, hematologic malignancy characterized by clonal expansion of precursors to plasmacytoid dendritic cells with frequent cutaneous involvement, as seen in this case. The pattern of cutaneous involvement may include isolated areas with a purplish nodule or bruise-like papule. Alternatively, more disseminated purplish nodules/papules/macules may be present. Bone marrow involvement with associated cytopenias is also common, and becomes increasingly likely with disease progression. Leukemic dissemination may also be present at diagnosis (WHO Classification of Tumours of Haematopoietic and Lymphoid Tissues, 2017, Mod Pathol 2016;29:98). Lymph nodes are involved in 40 - 50% of cases. The male:female ratio is approximately 3:1. Patients are typically elderly but can be any age (Haematologica 2010;95:1873). A subset of cases may develop in relation to other myeloid neoplasms, especially chronic myelomonocytic leukemia (Am J Surg Pathol 2012;36:1302). Regardless of presentation, the prognosis of BPDCN remains poor, with median survival of 1 to 2 years. 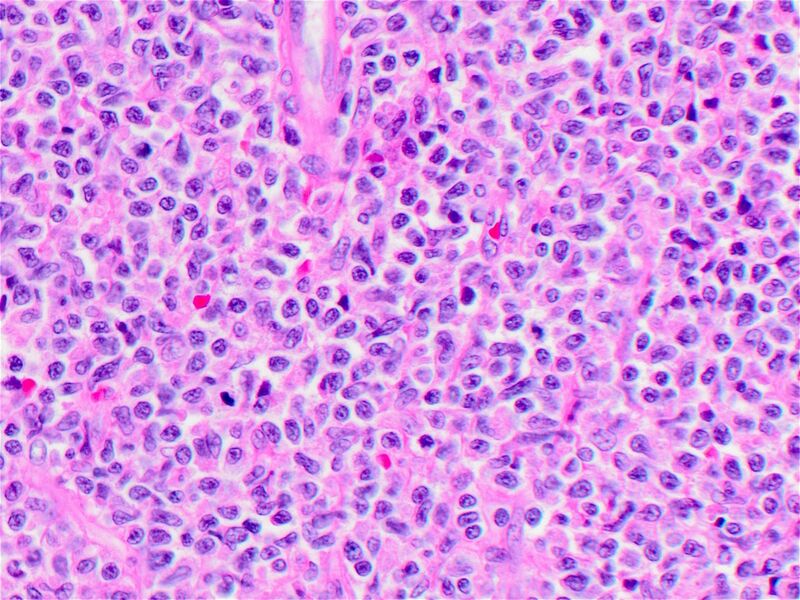 Histologically, a diffuse, monotonous proliferation of medium sized blast-like cells with relatively scant, greyish-blue cytoplasm is appreciated. The nuclei have irregular contours with fine chromatin and one or several small nucleoli (WHO Classification of Tumours of Haematopoietic and Lymphoid Tissues, 2017). There is typically extensive involvement of the dermis with extension into the subcutaneous fat but relative sparing of the epidermis. Lymph node involvement tends to be interfollicular with sparing of the B cell nodules. Bone marrow involvement may range from interstitial to massive replacement. 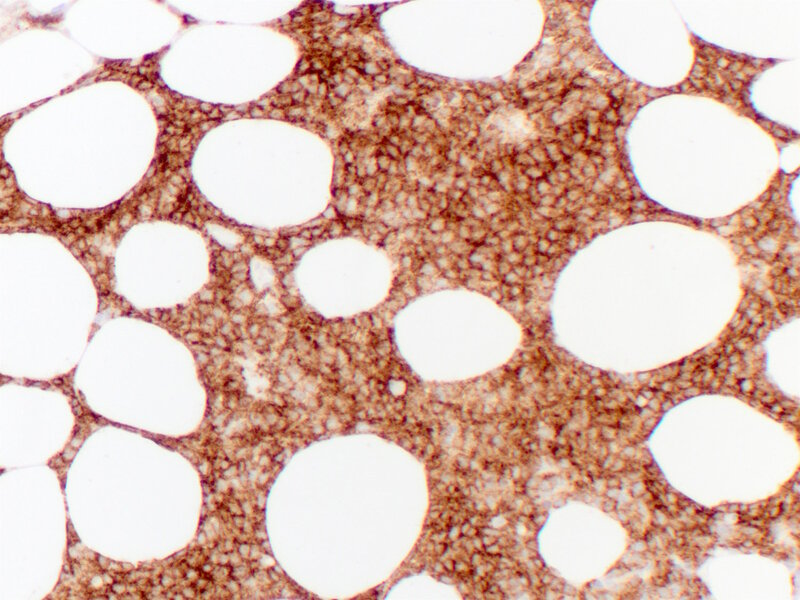 The bone marrow also frequently shows myelodysplastic features, particularly of the megakaryocytic lineage (Am J Hematol 2013;88:1055, Am J Clin Pathol 2005;123:662). There are several immunophenotypic markers that are characteristic of BPDCN (Am J Hematol 2013;88:1055). 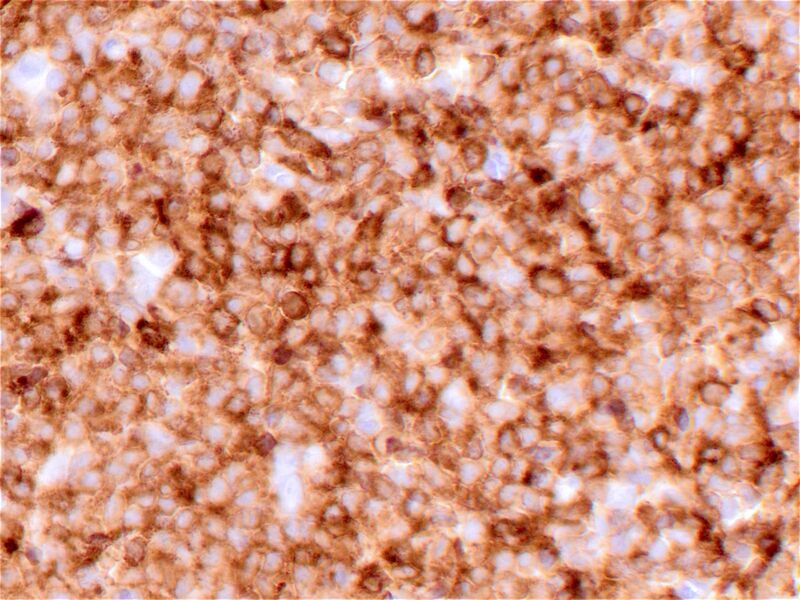 CD34 is typically negative by immunohistochemistry but may be positive by flow cytometry (Oncotarget 2015;6:19204). Other recently described although less commonly available markers that may be useful include the transcription factor TCF4, which drives plasmacytoid dendritic cell development (Cancer Cell 2016;30:764). In a subset of cases, negativity for CD4 or CD56 may occur and create further diagnostic challenge. S100 is positive in a subset of cases, including pediatric patients (Haematologica 2010;95:1873). • Mature plasmacytoid dendritic cell proliferations, which may also be seen in the setting of chronic myelomonocytic leukemia and involve the skin. 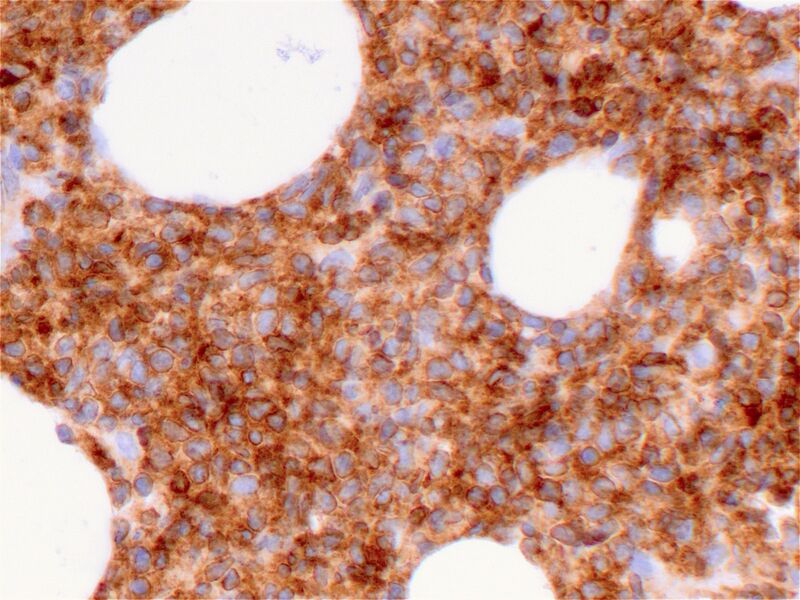 These show a mature morphology, low Ki67 proliferation rate and are negative for CD56, but may express a range of other atypical antigens in the setting of a primary marrow disorder (Mod Pathol 2016;29:98). • B lymphoblastic lymphoma or T lymphoblastic lymphoma. These typically express more B or T lineage markers in addition to TdT. CD10 is often positive and they have a very high Ki67 proliferation rate. In addition, clonal rearrangement of IG or TCR loci would be helpful. • Acute myeloid leukemia or myeloid sarcoma: typically show MPO or lysozyme, CD13, additional myeloid markers but significant overlap with monocytic tumors expressing CD4, CD56 and CD123 may occur. 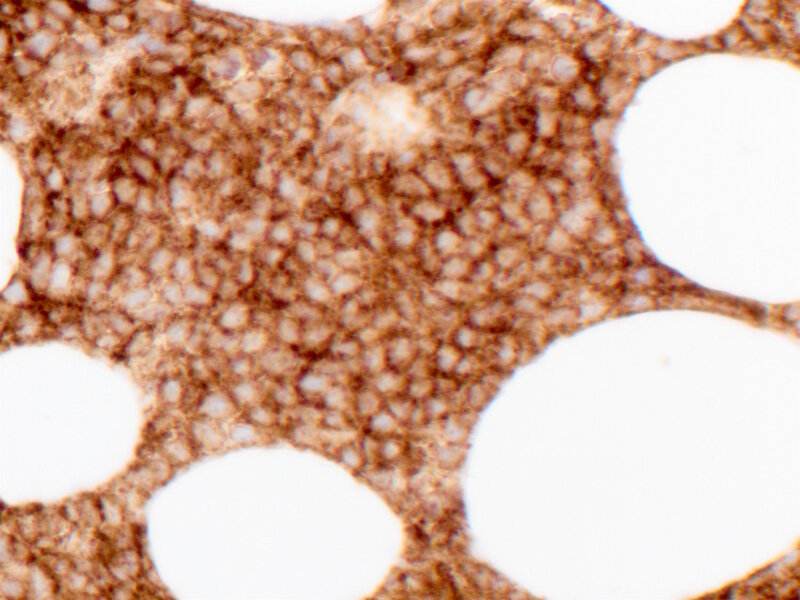 BPDCN may also show CD68, but typically in a dot-like pattern. • In some cases of acute leukemia, definitive lineage cannot be assigned and may fall into one of the categories of acute leukemias of ambiguous lineage (WHO Classification of Tumours of Haematopoietic and Lymphoid Tissues, 2017). Molecular studies demonstrate germline TCR and immunoglobulin loci, although an associated T cell clone may be present in some cases. A complex karyotype is seen in a subset of patients with recurrent abnormalities in chromosomes 5q, 12p, 13q, 6q, 15q, and 9 having been described (Blood 2002;99:4154). TET2 appears to be the most commonly mutated gene (Am J Hematol 2013;88:1055) with mutations in NRAS, ATM, MET, KRAS, IDH2 and KIT also being reported (Oncotarget 2014;5:6404). The prognosis of the disease is poor. Patients may respond initially to therapy but have subsequent relapse and disease resistance. The overall mean survival ranges from 10 - 22 months (WHO Classification of Tumours of Haematopoietic and Lymphoid Tissues, 2017). Better understanding of disease mechanisms and potential treatment strategies remain active areas of investigation. This patient was enrolled in a clinical trial of anti CD123 therapy, but progressed with this treatment. C. CD3. All others are typically positive in BPDCN, but can also be positive in other neoplasms including acute myeloid leukemia.